First and foremost, I am not a sailor. When I am on a boat, I am usually sitting back, relaxing with a cold beverage, while the “Captain” is leading the charge through channels and small lakes. The able seaman of Modest Mouse, Isaac Brock, had been chartering the indie-waters for years, until their breakthrough single “Float On” in 2001. With the mainstream success of Good News For People Who Love Bad News, cruise ship-size pressure is on for the band to match that voyage on We Were Dead Before The Ship Even Sank. Modest Mouse easily proves they could man any vessel when it comes to keeping an album afloat. The voyage begins on the triumphant lead track, “March Into the Sea”. Brock snarls and cackles his way through the track bouncing off the wavy atmosphere the percussion creates. It comes off perfectly as though a drunken fearless pirate is waging war with a stormy sea. One of the strengths of the album is how Brock can make any noise he wants to mimic the music his band members arrange and it is a testament to their chemistry (also see “Steam Enginius” and “Spitting Venom”). 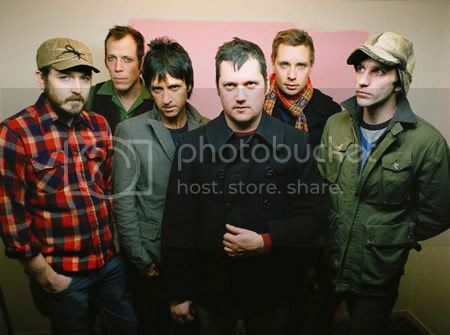 The mix of wails and shouts continues on “Invisible”, where the crew of Modest Mouse defiantly stands there ground against the sea. The paranoia-filled song reaches its peak at the end by repeating the “We’ll get crushed by the ocean/But it will not get us wet” in unison. Even a surprise guest pops up on “We’ve Got Everything” and the wistful tale about the tides of life, “Missed the Boat” is James Mercer, of the Shins. Mercer doesn’t steal the show from his Northwest associates, but adds a nice touch with faint back up vocals. The album doesn’t wade through calm waters often and the results are mixed when it does. “Parting of the Sensory”, a rant of sorts about an argument with a superior and is one of the gems of the album. The last :30 are the most impactful with the militant send off “Someday you will die somehow and somethings gonna steal your carbon.” The increase in percussion sounds like an exultant march off the ship in mutiny. On “Little Motel”, the pace is slowed to a crawl and is one of the few spots “Sank” feels anchored to the dock. The tale of a bitter ex-lover seems forced and attempts to capsize the effort, but unsuccessfully.